Know about miracles of Shirdi Sai Baba, subtle and sublime miracles of Saibaba that saved mankind. Sai Baba of Shirdi is an epitome of spiritual perfection and has been the guiding source for the mankind leading to salvation. As a spiritual guru and savior Shri Saibaba was no ordinary fakir but an avatar of high order. This was evident through his miracles and sayings that exhibited his purpose and intention for which he had come. He would often say, "My Leela is inscrutable". Saibaba's Leela's (miracles) were plenty and varied; here are a few of the miracles of Shirdi Saibaba, for his devotees and those interested in his philosophies. This is among the earliest evidences of Saibaba's miracles. Baba was fond of lighting earthenware lamps in his masjid and other temples. For this he needed oil, which he got from the grocers of Shirdi, as small donations. But there came a time when the grocers got tired of giving him oil for free. And so they refused him any oil saying they had no fresh stocks. Baba didn't say a word and returned to his masjid. But the masjid was not to remain in dark, as Sai Baba lit his earthenware lamps pouring water instead, which burnt deep into the midnight. Such was the miraculous power of Saibaba who lit fire out of water! When grocers came to know about it they rushed to him with apologies. Sai Baba pardoned them, but he warned them never to lie again. "You could have refused to give me the oil, but did you have to say that you didn't have fresh stocks?" he admonished them. But he had made his point. 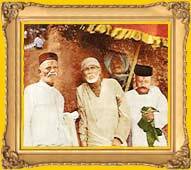 Once, harvesting in Shirdi had been completed and the foodgrains of the entire village had been stored in a yard. Blistering summer was ferocious. One afternoon Saibaba summoned Kondaji Sutar and asked him to better rush to his field as it was on fire. Fear struck Kondaji ran to his field but there was not a trace of smoke. He got back and said so to Saibaba. Unfazed Baba asked him to look again and as the luck would have it, a part of corn was indeed afire and smoke was beginning to billow from it. With strong wind fanning the fire, Kondaji became jittery and asked Saibaba to do something. At this Baba walked to the yard and sprinkled some water and the fire immediately got extinguished. There goes a story that one Rao Bahadur Moreshwar Pradhan s wife had come for Sai Baba's darshan. As the couple was about to leave, it began to rain heavily with thunder and lightening. Seeing the Pradhan couple in trouble, Saibaba invoked the God and asked the rain to calm down, which surely did and the Pradhan were able to reach their destination safely. When Sai Baba first came to Shirdi it had of no basic facilities. There was a well put only in name, with no natural spring water. Villagers had tough time fetching water from a distance. When the villagers were to celebrate Baba's birthday on Ramnavami, there was obviously crisis of water in the region. But Saibaba with his miracles had solution for this problem as well. He showered some leaves into the well and lo and behold the level of water rose fulfilling the dire wish of the villagers. Once a 3-year-old daughter of a poor man named Babu Kirwandikar had fallen into a well and got drowned. When the villagers rushed to the well, they found to their utter disbelief that the child was suspended in midair as if some invisible hand was holding her. This again was one of the many miracles of Saibaba that saved people from distress. As recounted by Das Ganu, one of the disciples of Shri Saibaba, once he sought permission from Baba to visit a place called Singba on the banks of Godavari to have a holy bath. Saibaba refused and said what was the use of going that distance when Godavari was right under his feet. Das was puzzled. Realizing the doubt in Das's mind Saibaba asked him to come closer and hold the hollow of his palms at Baba's feet. As soon as he did so water flowed freely out of the toes of the master's feet and filled the hollow of Das Ganu's palms in no time. His joy knew no limits. He sprinkled the water on his head and his body and distributed some more among the assembled devotees as tirtha (holy water).